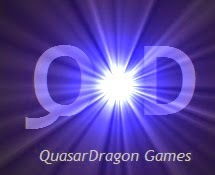 QuasarDragon: Now Posted: Subterranean Press Magazine Fall 2013. Now Posted: Subterranean Press Magazine Fall 2013. Subterranean Press Magazine Fall 2013. The latest issue of this always outstanding magazine is out with four stories for online reading, as well as epub and mobi downloads. One of the better ezines. 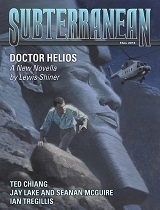 • "Doctor Helios" by Lewis Shiner. "Through the window of the Boeing 707 he watched the Nile as it flowed toward the distant Mediterranean. It glinted silver in the noonday sun, then turned greenish-brown as the airliner banked over the pyramids at Giza and descended toward the brand-new Cairo International Airport northeast of the city." • "The Truth of Fact, the Truth of Feeling" by Ted Chiang. "When my daughter Nicole was an infant, I read an essay suggesting that it might no longer be necessary to teach children how to read or write, because speech recognition and synthesis would soon render those abilities superfluous. My wife and I were horrified by the idea, and we resolved that, no matter how sophisticated technology became, our daughter’s skills would always rest on the bedrock of traditional literacy"
• "Hook Agonistes" by Jay Lake and Seanan McGuire. "Memory didn’t work the way that he remembered it. In the beginning there was Lowryland, and Lowryland would last forever, a monument to the eternal child within each and every one of—"
• "What Doctor Ivanovich Saw" by Ian Tregillis. "It was an early Wednesday morning, the day they first tested the psychic woman’s Faraday cage, when Aleksandr Ivanovich Grigoryev lost thirty rubles in a bet with a skeptical Cossack. Ivanovich always remembered it was a Wednesday because that same morning he was summoned to the general-colonel’s office, where the overseer of Arzamas-16 informed him that Dmitrii, his last surviving son, had died fighting valiantly on the Eastern Front. Dmitrii, who had been a cook’s assistant."